A multi cache in the expanding and much-loved Village Sign series. You are looking for a disguised container. Foulden is a civil parish in Norfolk. It covers an area of 12.95 km2 (5.00 sq mi) and had a population of 444 in 176 households at the 2001 census, including Beckett End but decreasing to a population of 430 also in 176 households at the 2011 census. For the purposes of local government, it falls within the district of Breckland. 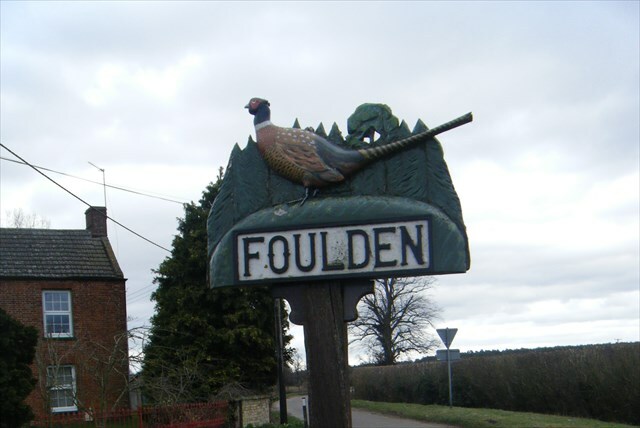 "Foulden" derives from the words "fowl" and "den", meaning "hill frequented by birds". It was recorded as "Fugalduna" in the Domesday Book. The village lies on the edge of Thetford Forest. Birdlife is plentiful owing to the many trees in the area, large stretches of open water, and its location near the Fens. To the north of the village is Foulden Common, a SSSI. Local industry is primarily agricultural, including dairy farming, sugar beet and other crops. The Salvation Army Commissioner, John Lawley was born in the village in 1859. The village hall was built in the 1970s by residents of Foulden. Today a wide range of events can be enjoyed at the hall or can be hired on a private basis. It is just a short walk away from the sign itself. If anyone would like to add to this popular and growing Village Sign series please contact Smokeypugs and he will allocate you its own unique number.